Last year when I presented at FlipCon on the Gold Coast I started off with a statement. This statement was “Fail to Plan and you plan to Fail”. As I look forward to 2017 and reflect on the year that has almost gone these words ring so true. I did plan last year in general terms of what I wanted to achieve in my job and for my students but in the end I haven’t achieved as much as I would have liked to and if I am honest with myself some of this is through not enough in depth planning. So again as I look forward to 2017 I am going to take my own advice and plan more. 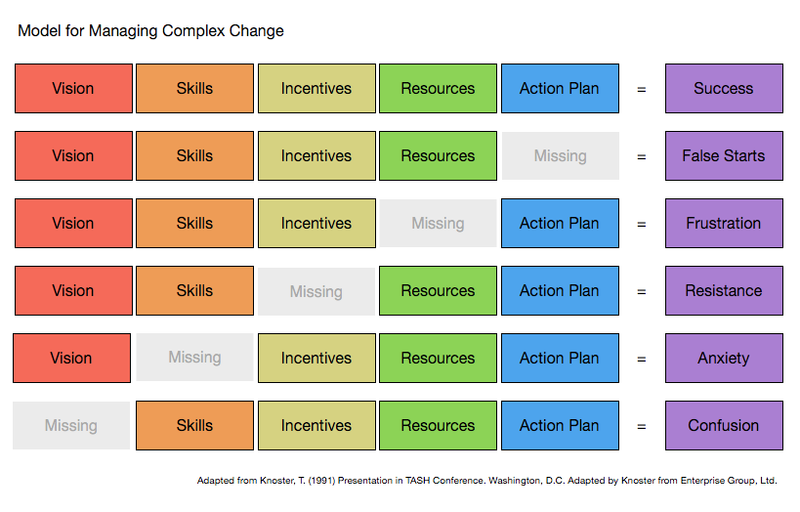 In reviewing some of the PD that I have attended in the last couple of years I came across this graphic adapted from Knoster, T (1991) on leading complex change. As any teacher in the education system knows the ‘status quo’ is never good enough we are always looking for the next big fix. In Queensland next year not only will we strive for the bigger and better NAPLAN results in years 7 and 9, we will also start to prepare for the beginning of 35 ACARA senior subjects in 2018. In planning for next year I have tried to keep the points that Knoster makes in mind to ensure that we have a successful year. In my role for 2017, I am tasked with driving the continual improvement of numeracy results for NAPLAN, ensuring that the whole school gets on board with the numeracy agenda, preparing staff to implement 4 new senior subjects in 2018 and continuing to develop staff in the productive implementation of the current year 7-10 ACARA syllabuses. So as you can see planning for me is key. (an explanation can be found here: https://www.projectsmart.co.uk/smart-goals.php ) for whole school numeracy change, a timeline for action steps in the Senior ACARA implementation and an overview of the goals for my maths faculty for 2017 which I will share with my staff. These documents will hopefully help me to address the first point that Knoster makes regarding vision and allow me to share this in a clear way with my staff. They should also help me to plan effectively to ensure that all the other points are considered. I will share some more details over the next couple of weeks of the documents that I have created above and how I hope they will help me to be an effective leader in 2017. How are you planning for next year? Feel free to comment below. This entry was posted in Leadership, planning and tagged ACARA, change, education, Knoster, lead, numeracy, planning, SMART. Bookmark the permalink.